Partial Share: Arugula, carrots, zucchini, yellow squash, sun gold tomatoes, cucumber, corn, poblano peppers, and onion. While cold, smoky and lots of air flow makes for a great Christmas ham, it made for very strange harvest conditions this morning on the farm. Fortunately, the little bit of rain we received seemed to lessen the acrid smell of the smoke. Between the smoke, and the cool nights, it’s starting to feel more and more like fall is approaching. 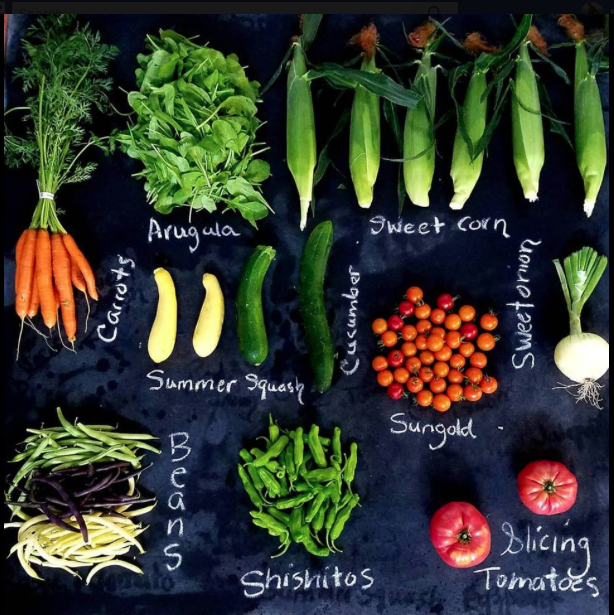 And while that may be true, the farm is still in peak summer mode, pumping out lots of tomatoes, beans, peppers, cucumbers and sweet corn…yes, the Sweet Corn is finally ready! However, it’s also that time of year when we start to keep our eye out for that first frost which is likely in the not too distant future. At this point, we are harvesting a lot of food every day, and in our spare moments trying to get the garlic cleaned to make room in the greenhouse for all the onions and winter squash that are ready and in need of curing. No to mention the storage cabbage, potatoes, and storage carrots are all ready as well. I don’t know who’s idea it was to grow all this garlic, but the huge job of cleaning it hits right as things seem to be slowing down again, once again delaying our leisurely nights of instant video sessions. As for my random moment of the week, I was spreading compost in High Tunnel #2 on Sunday to prepare it for fall planting. We’ve all probably heard the term “farm to fork”, where food leaves the farm and ends up on your plate, and I guess composting food waste completes that cycle, by bringing food waste from your plate back to the farm to build soil. 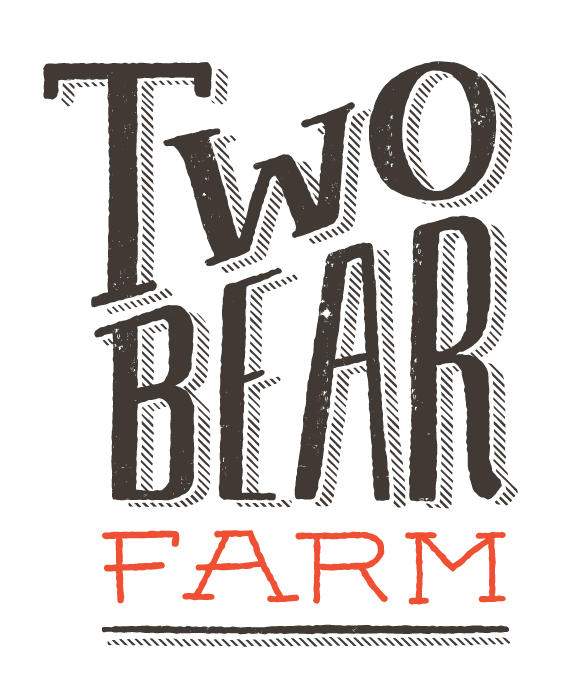 Fork to Farm, if you will. 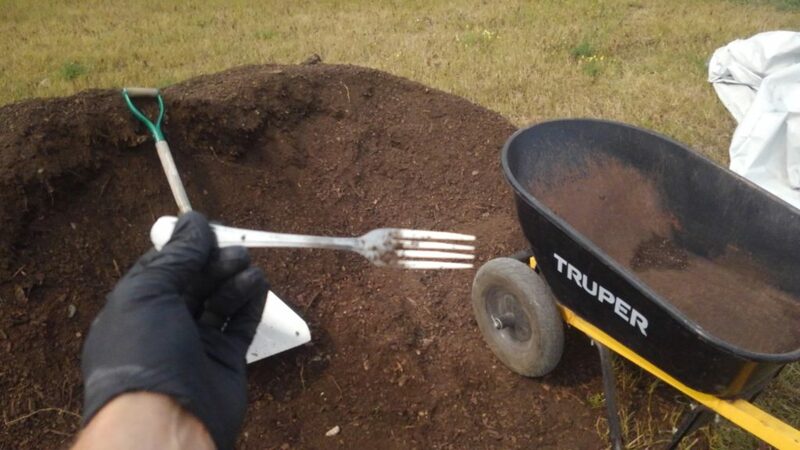 To drive that point home, I found a fork in our compost. And a butter knife. The composting process must have really cleaned them up well, as Rebecca didn’t mention any off-flavors when I let her eat dinner with it last night. Being raised in a vegetable farming family, we take our sweet corn very seriously. And here in the coldest corner of the Flathead, we work hard for our corn. No simply dropping some corn seed in the soil and waiting three months….here we take such dramatic steps to ensure August sweet corn that one might begin to question our sanity. We seed the corn in plug trays in the greenhouse in May. Once they are 6 inches tall, we then plant them out in the field using the water-wheel transplanter. Then we hoop and cover all the rows with floating row cover until the fourth of July. Then we pull all the hoops and covers out, and let the corn take off in the July heat. It’s a lot of work, but we think its worth it! If you have not had our corn yet, I think you will be pleasantly surprised by how tender and sweet it is. Two important things to know….First, this variety of corn is so tender, that you really don’t need to cook it. You can literally husk it and eat it raw. If you want to warm it up a bit so that your butter melts on it better, a quick dip in hot water is all that’s needed. No need to really cook it. Second, the corn is at it’s sweetest right after it’s picked. Over time, the sugars change to starch, and the quality of the corn decreases, which is why your frequently see corn packed on ice. My point being, you should eat your corn within a day or two after you receive your share. Every year, a CSA member at week #16 pickup tells me they still have the sweet corn sitting in their fridge from week #15. I do my best not to gasp or let my eyes roll up in my head, but such restraint is hard under the circumstances. As prolific as the squash are, we are doing our best not to overwhelm you this week, so we have backed off on the yellow squash. For the full shares, who are receiving the shishito peppers, these are a mild green pepper than is best prepared by searing in a hot pan. All you need to do is heat a pan or wok to high heat, add a dash of oil, and thrown in the peppers. Brown them on both sides, and be sure to turn on your fan hood to handle the smoke. After just a couple of minutes, pull them out, sprinkle some sea salt on them, and eat them whole. This week we are giving out arugula instead of salad mix, so here are a couple of ideas. This light salad sound delicious. Or here are 31 other ideas! 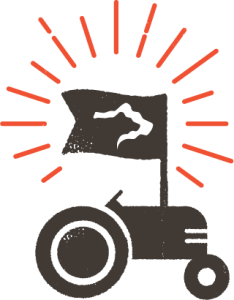 Here’s hoping the smoke dissipates and we can enjoy a pleasant late summer and fall….see you all at CSA pickup.